You are here: Home / Uncategorized / What’s your point? Over the weekend, I happened to catch a 3-hour documentary on Abraham Lincoln (showing my dedication to being a history nerd). It was an interesting psychological study of Lincoln, and it really concentrated a lot more on his youth than on his years as President. One particular thought really interested me. 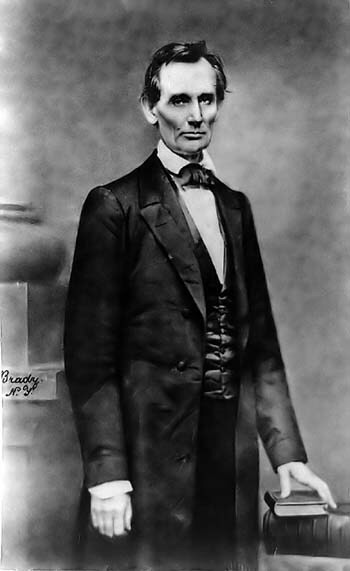 When Lincoln was in his early 40s, trying to earn his place in the state legislature, his political rhetoric was mostly focused on why his opponents were crappy. In fact, he apparently obliterated one peer so harshly that the man broke into tears on the House floor. Lincoln penned anonymous letters to Illinois newspapers about how the Democrats were a bunch of morons. It was the nadir of his career, by the way. He thought that he was a complete failure. Then, Stephen Douglas put together the Kansas-Nebraska act, which basically said, “Um, hi. We can’t figure out this slavery thing. Every time there’s a new territory, we have to put together a compromise, and it just stinks. So why don’t all y’all just figure it out territory by territory.” Lincoln was enraged by this alleged compromise and sprung into action. It did not take long for him to put together his thought that “A House Divided Cannot Stand.” He had something he believed in fervently. He had a message. And not long after that, he was President of the United States. This is not to say that all of your posts have to be on the exact same subject, but have a message. Have a series of passions that you tend to reflect on in your online world. Let people connect with you on things. As Lincoln continued to write speeches about and debate the issue of slavery, his rhetoric got better and better. He found new ways to disarm his opponents. He found new analogies to make his points more clear. I’m not saying that you need to become “the expert.” But get something that you can really sink your teeth into, and then study it. Uncover new ways of talking about it. See if you can convince someone who disagrees with you that you actually are on to something. If you are talking about everything under the sun, you can’t really settle on a style, which makes it harder for people to connect with what you are saying and doing. If you are floating from subject to subject and you are online to promote or represent your business/brand, then you are going to find that success will hide from you. Whether your point is why your company is smarter than others, why your company will make your customers seem smarter, or why your company is the most cost-effective, you need to not only have a point, but you need that point to be about as sharp as you can stand it. What is your mission? What is the point you want your prospects and customers to understand about you right away? Abraham Lincoln wanted people to know that he wanted to preserve the Union. That was his thing. Slavery was ripping apart the Union, and therefore Lincoln was all for ending the debate. JFK was about the future. He wanted people to know that if he was elected, we’d be doing all sorts of new and exciting things. FDR was the New Deal guy. What’s your “thing”? What’s your point? What should I know about you? As far as what my personal blog will be about, it is going to be much more personal. My biggest goal in life is to help people who feel stuck. It will be about helping others who maybe have been abused, or for other reasons feel that they do not have much to offer.I have been there myself, and if I can find a way up and out, I feel it is my duty to try to help others to do the same. This blog will be nothing like the company blog, and I am fine with that. The greatest gift I ever got was the chance to put myself first for the first time over five years ago when I left a highly abusive marriage. I want to be able to get the message out there that we are never without hope. I’m so sorry to hear you went through such a bad experience, my friend. Huge, huge props to you for getting that out there to help other people in a similar boat. You rock!